﻿If one is to think in the vein of Borges’s Garden of Forking Paths (1), even the most banal of decisions can lead to an opening of an infinite amount of alternative universes; in other words, individual decisions can influence events on a larger order of scale if one were to look at the ramifications playing in time a hundred or a thousand years later. The Manhattan Grid devised in 1811 by Simeon deWitt, Gouverneur Morris and John Rutherford might have been as a simple economic strategy at the time, the apparently innocuous gridization of a plot of land and the creation of 2, 028 blocks. That decision though, became an urban project that ultimately changed the history of a little island located on the east coast of a young nation, and later would change the entire world with its own archetype of modernity and metropolitan values. Permeating the mind of everyone that thinks of progress for centuries with those endless vertical structures, New York hundred and fifty years later, sits as one of the most utopian realities that humankind has ever created, a true testing ground for Manhattanism or the culture of congestion, as Koolhaas would later theorize. Just as Koolhaas calls architecture part of Dali’s paranoid-critical method (2) based on the fact that architecture equals the ‘imposition on the world of structures it never asked for', his manifesto is equally unrequested. The word retroactive is inserted in the title to denote that it was written afterwards, retrospectively. Rem Koolhaas is a gifted storyteller. On one hand a historian and methodical researcher, and on the other a creator of fantasies, a narrator that gives way to his imagination letting architectural myths thrive. As with any genius, he clearly sees more than what meets the eye; Delirious New York, A Retroactive manifesto was at the time of its publication in 1978 an instant classic, and with merit, Koolhaas combines compelling historical facts with cool prose and unique phraseology. His storytelling is exciting and well-crafted allowing him to execute an incredibly complex task (a task that too easily could have been proven boring) such as the analyses of the key projects and developments that contributed to the spatial resolution of the city of New York. Just as the author would have it, this book is divided into blocks, just like the city he is analyzing and although chronological, chapters that can be read independently, parts of a text that sit independently yet part of the same experiment. The initial chapter is on prehistorical Manhattan: from Henry Hudson discovering the island of Manhattan in 1609, to the selling of the island from the natives to Peter Miniut for 24 dollars in 1626, to the establishment of New Amsterdam with only four families, to Jollain, the engraver of the first bird’s eye view of New Amsterdam in 1672, to the New York Fair in 1853 (inspired by the Crystal Palace exhibition two years before that) and last but not least, Elisha Otis’s development on the elevator technologies. From the prehistory we step into the development of Coney Island, a ‘fetal Manhattan’ where residents escaped the exploding city and which became a testing ground for new technologies in entertainment; dots in the continuum of the development of a new kind of society and its new activities, a ‘launching pad for the proletariat, a ‘systematic conversion of nature into a technical service’. After the prehistory and Coney Island, comes the Skyscraper and the Rockefeller Center where many key projects that contributed to Manhattanism are explained in detail: Downtown Athletic club, Radio City Music Hall, the Empire State, Waldorf Astoria hotel, the Rockefeller Center to name a few, this is where is where Koolhaas shines the brightest. These passages trace the frenetic phase of 1930s American society and their surreal creation: Manhattanism, the metropolis of congestion, the american sublime disguised as pragmatism. Rem invites us to envision a city of ghosts incarnated due to some historical urban accidents, laws and theorems(3) but mostly to its dreamers and theorists: Raymond Hood, Harvey Wiley Corbett, Hugh Ferris, Wallace K. Harrison, Andrew Reinhard, William F Lamb, and many many more. 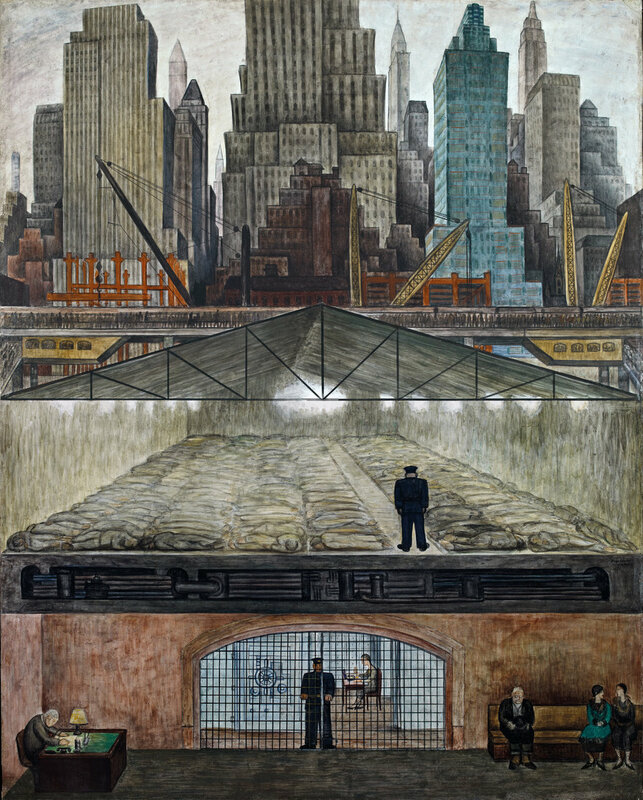 What follows are two fascinating passages, one retelling a brief story behind Diego Rivera and his lost mural at the Rockefeller Center, what Koolhaas refers to ‘the fortuitous meeting of a layer of Communist paint and a Manhattan elevator bank’(4) and its final demise due to diverse political reasons, amongst them having portrayed Vladimir Lenin on it. The other passage is the ‘European invaders’ Salvador Dali and Le Corbusier visiting the city. Le Corbusier, strangely enough trying to convince everyone that its skyscrapers are too small and having too many of them. His anti-Manhattanism created a Horizontal skyscraper and a Radiant City (5) as a better urban alternatives. The main idea of my analysis of Delirious New York is that this book and its narrator have two main speeds. The accurate and more real one based on historical facts, and the narrative one, where reality is sort of painted more than described with the author’s unique and peculiar perspectives. And given that the author is one of the most inventive architects and better writers of the century, Delirious New York, holds a microcosm of brilliant architectural ideas(7) and beautiful turns of phrase. Is this phrase about architecture or about storytelling? Here the mentioned principle of juxtaposing history and narrative is at play, Koolhaas is simply talking about high-rises getting higher and higher but he also starts weaving a story explaining the creation of additional floors (or the multiplication of the plot) and with the ambition of building higher comes the sublime, the mystic storytelling and fantastic language, and hyper-modernity and hyper-efficiency, yet lurking behind are always the architectural systems of buildings, with its dirty pipes and concealed sewage, with its inalienable structure and heavy central core reminding us of the things that make us humans, therefore animals. A novel can remain abstract and aesthetic but with architecture the abstract always gets real.